Someone asked me the other day how long we had been in Kenya and it caught me off guard that it has been over six months. In fact, we’re coming up on seven months. In many ways it seems like we arrived just a few days ago and in other ways it seems like we’ve been here for years. I suppose that means things still seem new to us and also that we are comfortable. Since last September we have been spending time each week with a language tutor . . . trying to learn Swahili. It’s a very phonetic language so it’s easy to pronounce – you just sound out every letter. Our language tutor told us early on that Swahili is about 80% Bantu and 20% Arabic. They just add a vowel to the end of Arabic words. I have come to realize that he is not entirely correct, though. I’d say that Swahili is about 75% Bantu, 20% Arabic, and 5% English. Yes, I said English. With words like socksi (socks), shirti (shirt), filamu (film/movie), kabeji (cabbage), and soda (soda) there are times when I think Swahili is easy. But then there are words like dada which translates as “sister” or mamba (I’m thinking snake) which translates as “crocodile.” The most humorous one we’ve come across is nyanya which can translate as “tomato” or “grandmother” – depending on context, of course. 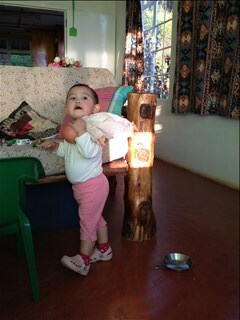 Maureen has been busy recently getting acclimated to the community health program at Kijabe Hospital. Luke really enjoys pre-school and looking out the window for monkeys or baboons. Kate seems to discover a new word each day and follows her brother around (or runs from him)! Thank you for your love and support . . . we feel blessed to be serving our Lord and Savior here in Kenya! We hope and pray that you are well. It’s hard to believe Christmas is almost here. May you enjoy your time with family and friends as we all celebrate the birth of Christ. The view from our house is nothing short of amazing. 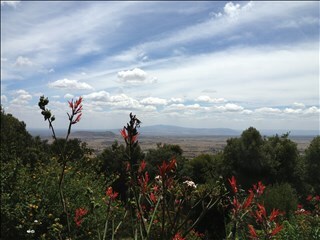 We had heard that Kijabe was beautiful but really had no idea. The volcano off in the distance (second photo) is Mt. Longonot. Based on a little internet research, it last erupted in the 1860s so we’re probably safe! Luke and his friend Finn playing under our clothes dryer. Kate bringing in the laundry. We have a small but nice yard where the children can run and play. Kate has ventured to roll down the hill. 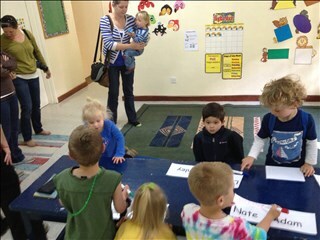 Luke having a good time at Pre-school. We generally meet with our language tutor, Edward, on the back porch. Currently Tim meets with Edward three hours a week and Maureen two. It’s been fun but challenging. They are both lacking the key tool, a kanga, a piece of cloth tied to the woman and supporting the child’s bottom. 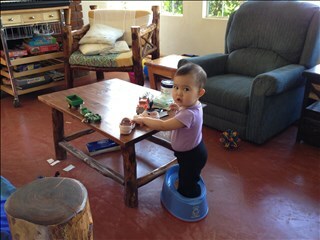 We gave Kate her potty and this is what she did. Hmm! 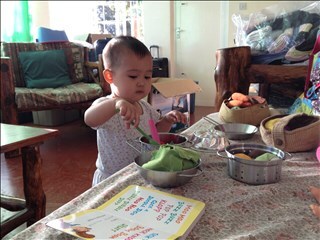 Play cooking is a favorite past time. 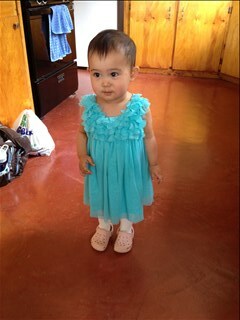 Our little princess – she loves to wear dresses. All ready for church! Tim’s Birthday. 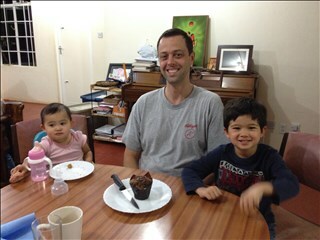 Think my two helpers ate most of my birthday cupcake! 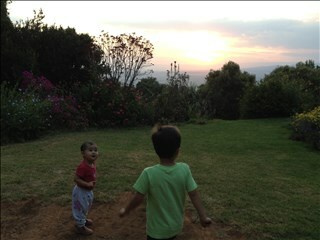 The kids also enjoy the occasional trip (30-minute hike) up to RVA (Rift Valley Academy) to play on the playground. 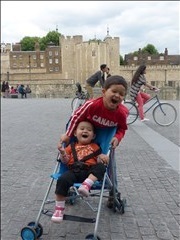 In our last newsletter we posted pictures of the various monkeys – including our own two little ones. The “wild” monkeys typically show up twice a day – morning and evening – and often end up climbing all over our house. So, sometimes between 6:30am and 7am we will be awakened by the very loud sound of monkeys climbing and jumping all over the metal roof of our house. 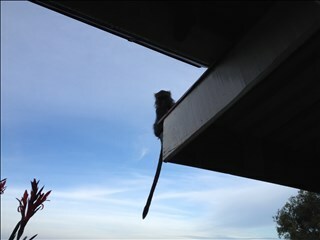 The little monkey in the photo was spying on Tim during his morning coffee time. The Maasai are a semi-nomadic people group located in Kenya and Tanzania. 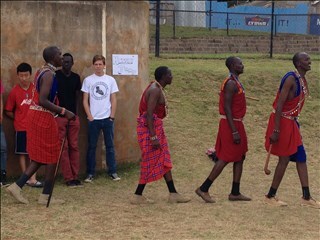 Some Maasai took part in RVA’s Multi-cultural day. Tim has had the opportunity to visit and preach at various churches. He recently visited a Kikuyu speaking area and had a great time hanging out with the kids. Wish we had a small version of this to decorate for Christmas! 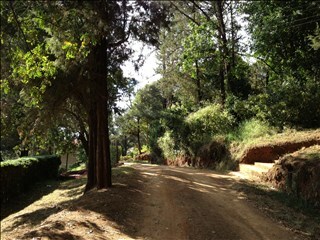 This is one of a few around Kijabe. 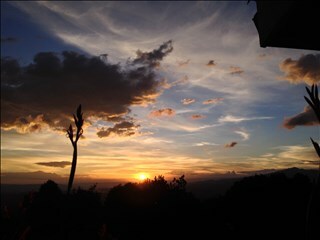 The sunset (unless it’s raining) is always breathtaking! We hope you have enjoyed our brief photo blog. Please pray that we will have a safe move to the neighboring house. It’s been raining every day for the past week, which might interfere with our move. Having to stay inside is also beginning to drive the kids a little stir crazy. Pray for our sanity and that we can make this Christmas memorable . . . through keeping our hearts and minds on Christ. Habari za asubuhi (Good morning)! 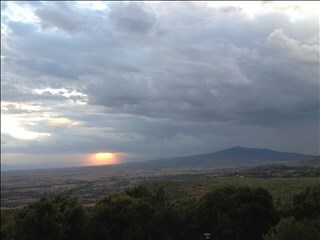 It’s hard to believe we’ve been in Kijabe for over a month now. We pray that you are well and want you to know that we are safe here in Kijabe. You have probably heard the news about the events at Westgate mall in Nairobi and we ask that you continue to pray for resolution as well as for those who are grieving. We arrived in Kijabe on August 21 – a very cold day! In fact, we arrived just as “winter” was ending. No, there is no snow, but it can get fairly cold here. Days were in the 60s and nights in the 40s. We’re told that July was even colder. Without a heat source it was difficult to make oneself get out of bed in the morning! It has warmed up some but we’re still looking at upper 70s during the day and 50s at night. The other factor to take into account is that the nights are very very windy! In fact, Kijabe means “place of wind.” If you didn’t know any better you’d think you were on the southeast coast with a tropical storm making landfall. At this point, I think we’d all agree that we are comfortable living here. In other words, we have a routine that is manageable. We know where to buy food, how to cook, how to do laundry, and have figured out where most everything is located. That said, we are still adjusting. 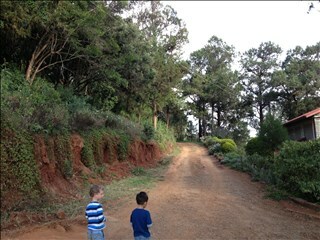 We walk almost everywhere we go and the roads are dirt, dusty, rocky, and at times extremely bumpy (i.e. full of pot holes). 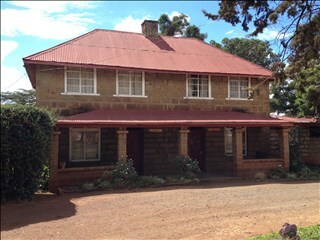 We’re still staying in the Moffat Guesthouse but will move into a house around October 1. It has been a little frustrating at times not being able to unpack. Occasionally we will think of something we need and then go on a treasure hunt through our luggage. We have an inventory for each piece of luggage but it’s not that exhaustive of a list. We have a room on the second floor – the only room with a private bathroom attached. There’s a bunk bed, a queen bed, and Kate sleeps in her pack-n-play. Our luggage/bins are lined up along one wall and we use them as shelving. The kitchen and dining areas are downstairs. Not ideal, but it works! Please pray that we are able to wait patiently for the house to open up, that our move goes smoothly, and that we can settle in quickly. Pray also that we are able to find additional house help. Luke and Kate are adjusting well. Kate did have a fever a few days after our arrival and we’re pretty sure she was just teething. A few doses of Tylenol and she was fine. 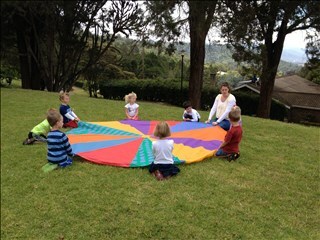 Luke has started pre-school (Mon/Wed/Fri from 9:30am-11:30am). At first we were a little hesitant (as was Luke) but he is enjoying the experience. The material is largely a review from what he covered during 3 year old pre-school but he’s making friends and learning to socialize. It is a thirty minute walk uphill but thankfully we have been able to catch a ride most days. Kate is constantly on the go, which can be a bit dangerous. 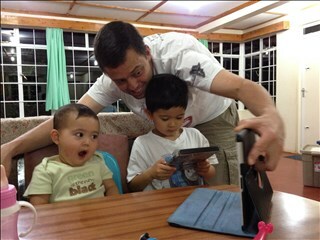 The guesthouse is not what one would call child friendly. We have hired a Kenyan lady to help watch the kids a few afternoons each week and they both seem to like her a great deal. In fact, Luke has been known to block the door so that Rebecca could not leave. The kids have also enjoyed looking out for monkeys and baboons which like to look through the trash pits in the community. In fact, as I sit here writing in the dining area of the guesthouse, I can see a troop of monkeys making their way across a shed heading toward their evening meal! J Please pray that Luke and Kate stay healthy and safe, that Luke would make good friends, and that both would feel at home here in Kijabe. 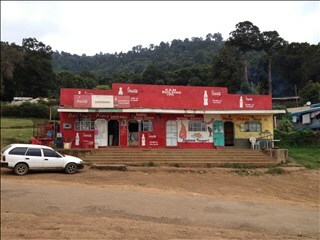 We’ve been into Nairobi a few times since arriving in Kijabe – to buy supplies, etc. 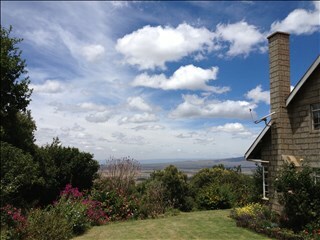 One day we were asked if we wanted to take a ride down to Naivasha and we were glad we accepted. Not only was it a nice (although bumpy) ride, but it was also a fun day trip . . . and we got to see some zebras. On the afternoons that we have childcare, we’ve scheduled language learning with an instructor. Even though one could easily get by with English here in Kijabe, leaning language will open doors to understanding culture. It will also help Maureen communicate in the hospital and help me connect with students. Please pray that we can focus on this important part of our ministry. There are two truisms about life in Africa which we’ve come to appreciate. First, things often don’t turn out as you expect. Second, tasks (even simple ones) take longer. We had hoped (expected) to have our work permits by this point but things changed. We knew that it would be a rush to have my work permit in hand before the fall term began. During late summer new government officials took office and the processing of work permits essentially halted. In fact, they stopped accepting new ones sometime in late July. We’ve been told that processing has begun again but don’t have a clear time on when we might receive our permits. So, at present we are not clear to work. In the past there was some flexibility but immigration officials have also begun to randomly check for work permits. To stay above reproach, SIM Kenya has instructed us to wait patiently. 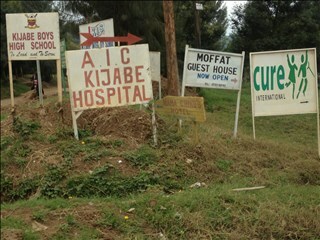 In the meantime, we are able to participate in Moffat and Hospital meetings/events. For me this means attending chapel, chai (tea) time and various student-led events (practical ministry reports and bible studies). For Maureen, this means sitting in on morning conferences and shadowing physicians. Pray that we will look for and expect meaningful opportunities to be used by God. Pray that our work permits would arrive in God’s timing. Pray also that we are able to adjust well to the reality of these two truisms – that we can establish a healthy routine so that our family will have an effective ministry. We’ve been warmly accepted by the community here in Kijabe. This means that we’ve had meals with numerous families! We’ve also gotten to know many wonderful people. There is so much to share and so little time to write, but we promise to write more later and ask that you keep us in your prayers as you are in ours. Our flight departed from London at 8:50pm and we checked out of our hotel at 4:30pm. We loaded our luggage, walked to the airport, checked in for our flight and they had to recheck all 17 bags plus strollers and cars seats again! Thank God we did not have to physically claim our bags and bring them to the counter! After this we bought dinner at an M&S store at the airport and then sat down to eat our sandwiches and chips. 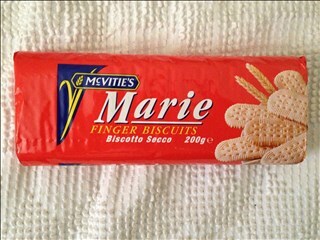 We bought some extra tea biscuits, chocolate chip cookies, and lengua de gato cookies. In hindsight, I should have bought more! 🙂 Anyway, we walked to our gate which took us almost 30 minutes, including riding a train, and boarded our flight soon after. Interestingly, there was an escalator, stairs, and an elevator at each gate to take you down a level to walk to the jet bridge. Our flight went smoothly, although none of us slept much. It was an eight hour flight but they didn’t finish serving meals until midnight, so there was not much time to sleep anyway. We arrived in Nairobi at 7:25am. Our plane parked at the cargo terminal – an isolated spot. Moments later, buses, trucks, and luggage carts started arriving. Armed soldiers also stood around the plane. We were close to the back so we decided to change Kate’s diaper before deplaning (glad I did!) and we ended up being the last ones to get off. It was a neat experience as we deplaned a Boeing 777 by stairs down to the ground. We then were shuttled by a bus to an area with tents. Remember that the international arrivals area was burned down just 6 days prior. The customs forms were on tables under tents. It was a little windy, so there were rocks and boards for paper weights. We asked and discovered that we had to fill out one customs declaration and tourist visa application for each one of us. It took a while as we carefully filled these out. While we were doing this, Luke needed to use the bathroom. Lo and behold, nearby there were porta potties. I was really glad I changed Kate before we left the plane! When we walked to the next tent, the immigration officer asked, “What took you so long?” We told him we were filling out the forms. He then took our papers and put it in a pile but never even looked at them. We paid our US$50 each for our visas. They only take cash and only paper money, no credit cards or coins! We’re glad we were told to bring cash in advance as there was one guy who had small change and they wouldn’t let him through. We then walked to the next tent where we ended up outside in the open air staring at bags scattered everywhere. There were no signs or markers saying what flight these bags belong to. So we started spotting our bags which was not difficult since we have mostly bins. It was very difficult as Tim had to find each one and carry them over to where I stood with the kids. 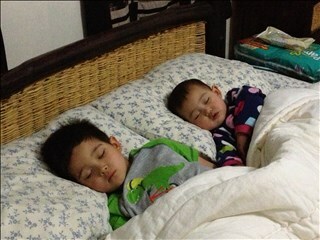 They were still in “sleepy, tired, shock” mode at this time. We finally found all our bags minus one. Our only large bin was missing. Thankfully, God sent this lady who was in charge in the area to get some guys to help Tim push the six carts of luggages toward a scanner built into a truck. They had to unload each bag and put it through the scanner, then pick it back up on the other side and load the bags onto the same cart. We showed our passports in a small room as we walked through a small building and then we were “free”. We had just passed through customs without realizing it! Thankfully the guys helped park our carts by the exit as Tim went to find the people from SIM Kenya who were picking us up! We also had to look at each bag to figure out which baggage tag was missing. The lady even went out of her way to call the number we had of the person picking us up since there were no clear signs indicating arrivals and where people waiting for arrivals should wait. We finally found them and she helped Tim push our carts to the parking lot down the street. 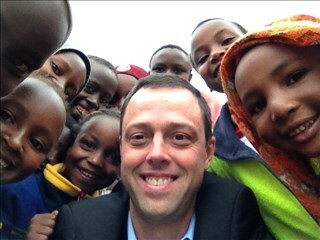 The kids and I went last and we finally met Bev Howell, the acting director of SIM Kenya. 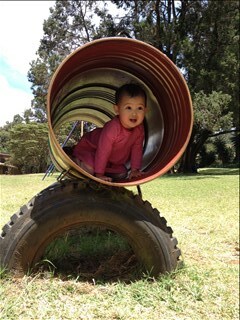 She came with another Kenyan SIM missionary who was very resourceful, smart, and daring! He carefully lifted our luggages and bins to fill up a large roof rack on top of a Land Cruiser and tied them down with rope. The rest he fitted into the back of his Land Cruiser. Now don’t think this was a cushy vehicle – it was a well used, beat up vehicle that had seen many rough roads. We were able to fit all our belongings, 17 luggages and bins plus two strollers and two car seats, on the top and in the back of this vehicle. We then carefully piled into the second row. We were ready to go, but guess what? The vehicle wouldn’t start! Oh no! We all started laughing! A taxi driver offered to jump start it, but it did not work, so a few guys started to push the vehicle backwards with all of us inside plus all the bags! They got it to start within a couple of seconds as we backed out of our spot! We’d never seen a car jump start while being pushed backwards :-). It was already 11am, when we arrived at our place. We were tired more than anything else. They had kindly stocked our kitchen with the basics of coffee, tea (very important in Kenya), peanut butter, jam, sugar, margarine, a loaf of bread, and ramen noodles. We decided to stay home for lunch and go for groceries afterwards. Daniel Ondere, one of the kindest men we’ve ever met was our guide. He is SIM Kenya’s Field officer and a very humble man. He was very understanding, protective of our kids and thoughtful to our needs as a family. He took us to buy groceries and actually walked the aisles with us showing us where things were. 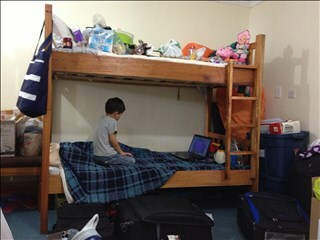 He took Tim to figure out our internet options and to set things up. He took us to a Kenyan restaurant along with Clarice, another SIM staff for our first Kenyan meal. He also arranged for us to visit an elephant orphanage for our kids to enjoy. He was available to us when we needed anything. The first thing he taught us when we walked to the store was how to cross the street. We stopped at the road and he said “look right, don’t look left”. Those were very profound words, because our instinct is always to look to the left first. So that was our first lesson in crossing the street in Nairobi. The first 2 days we used taxis as we were tired and weary of walking on pot-holed dirt roads with no sidewalks. On the third day, we started walking everywhere and realized that things were a lot closer than we thought. We arrived on a Monday, and that afternoon we just went to Uchumi, the nearest grocery store, to buy some milk and other groceries. That evening, Bev took us out for dinner. We went to Java House, a local Starbucks equivalent, but they serve breakfast , lunch, and dinner, in addition to coffee. It is a place to hangout, and they have free wifi, if you can get on it. We had a good meal and the kids amazingly did very well. Their food is also safe to eat, if you know what I mean. Tuesday morning we attended a language seminar that is scheduled once a month. Thankfully we were able to make it even though we got there late. It was very informative and amazingly Luke sat through the entire morning with his dad. Kate, however, had to leave at mid session. But I got to meet some new people as we sat and played in a fellowship area. They have chai time daily around 10am and they make chai and coffee, and since today was seminar day, we had some special snacks. We went home to eat lunch and head out to Nakumatt, their local Walmart equivalent, to shop for more stuff and to orient ourselves to what is available in Nairobi. After this, we dropped off our groceries and headed off to Rosé compound, where a lot of the SIM Kenya missionaries live. They had a large grassy area for children to play and a makeshift treehouse. Luke was so excited as there were a bunch of kids playing when we arrived. We got to see some of the missionaries we met earlier in the day and meet some new ones. Luke initially watched, but before too long was running around playing hide and seek and having a great time. Kate also wandered off and before we knew it, Bev was carrying her, and introducing her to the kids. We were able to chat with a few missionaries who had arrived just a month, and a week before us. We were scheduled to have dinner with the Maloneys who lived on the compound, so we headed off to their home around 5:30. They have a 2 year old so we connected really well. We enjoyed the meal and were able to ask a lot of questions. 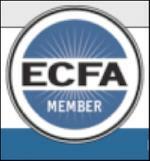 They were very helpful and very eager to help us in any way we needed. The kids played as we talked and had a great time. They drove us home as it is not safe walking after 6:30pm. There are no street lights and accidents are common. It was also drizzling. After we got home and bathed the kids, off we went to bed tired after a looooong day. Wednesday was our day off. It rained most of the day and it was a perfect day to stay home. 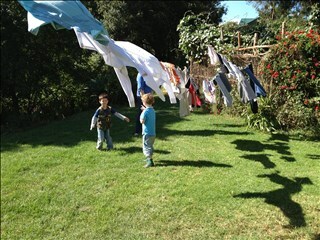 We cooked our first meal in Nairobi, did our first load of laundry in a washing machine (thank God!) 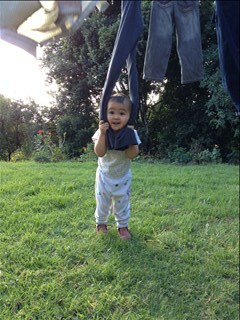 and hung our clothes on the line to dry. It took more than a day to dry the clothes. We cooked chicken in a broiler that we brought along with rice and broccoli. We all enjoyed it, especially Luke! 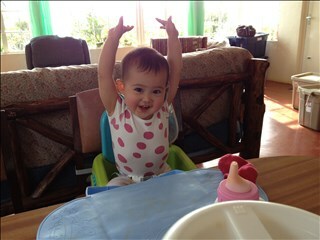 Our breakfasts had been eggs, corn flakes with milk, oatmeal, or peanut butter sandwich with red plum jam. Thursday and Friday we had orientation in the morning and were free during the afternoon. We spent some of it familiarizing ourselves with the stores and what was available in them. Saturday we went to the elephant orphanage where we saw baby and very young elephants feed and play. These gentle creatures were found in the wild and rescued from harm. Their mothers have mostly been killed by poachers. It was a fun time for all especially Luke! Sunday we went to church then home for lunch. Then we spent the afternoon shopping for Kijabe. We had a wonderful dinner and fellowship with George and Sara Salloum. 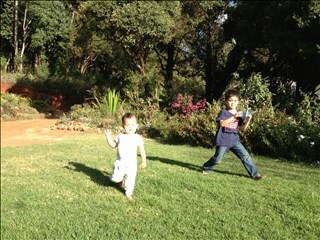 The kids especially enjoyed playing in their home. Monday we had more orientation then our fellow missionary Stephanie showed us around Yaya center, another place to hangout and shop, then we walked to meet Fey, another missionary who took Maureen to Toi market. We had a long but good day! 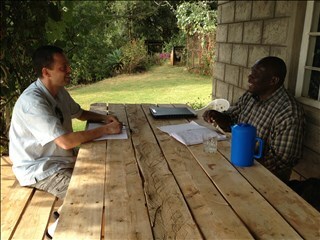 Tuesday morning was prayer time for all missionaries in SIM Kenya. We got to meet the SIM family there and they welcomed all the new comers. 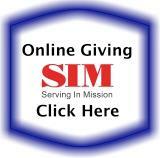 SIM Kenya literally doubled its size in the past year, so there are a lot of new faces! After his we went home, kids had naps and then we went to buy stuff to bring to Kijabe. 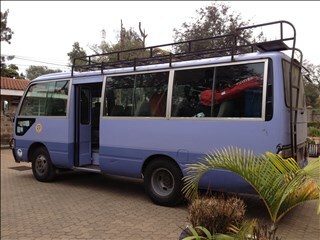 Wednesday morning we got up and got ready for our trip to Kijabe. It was a nice day and a 25 seater bus arrived at the compound. 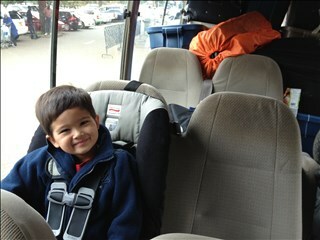 Tim attached the car seats and after loading all our bags and supplies, there was a lot of room to spare. We left around 12 noon and stopped by Junction to buy more Internet bundles and used the opportunity to treat ourselves with our first KFC meal for lunch! This is the only familiar fast food chain here :-). 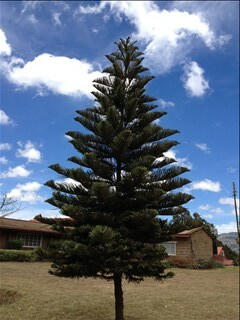 We arrived in Kijabe at 3:30pm. It was a smooth drive except for one police checkpoint. 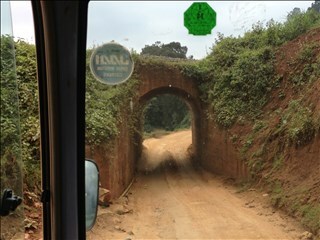 The scenery was beautiful as we got closer to Kijabe, but the roads gotten bumpier and narrower! Asante sana! (thank you so much) for your prayers for our family. Your prayers have brought us safely to Nairobi and through almost a week of orientation. We feel so blessed to have you all praying for us. Our journey was interrupted, but God kept us safe and gave us rest. I (Maureen) want to take a step back and share a few more details about our experiences over the past two weeks . . . for those interested. We finally ended up with 17 checked bags, plus strollers and car seats. In the end, we had 22 checked items. Our friend Arlin was kind enough to help us transport our bags to the airport a few hours before our flight. We had a smooth check-in process, a total of 30 minutes-a miracle in itself. When we showed up at the counter there was no line, but after we left a line had formed. 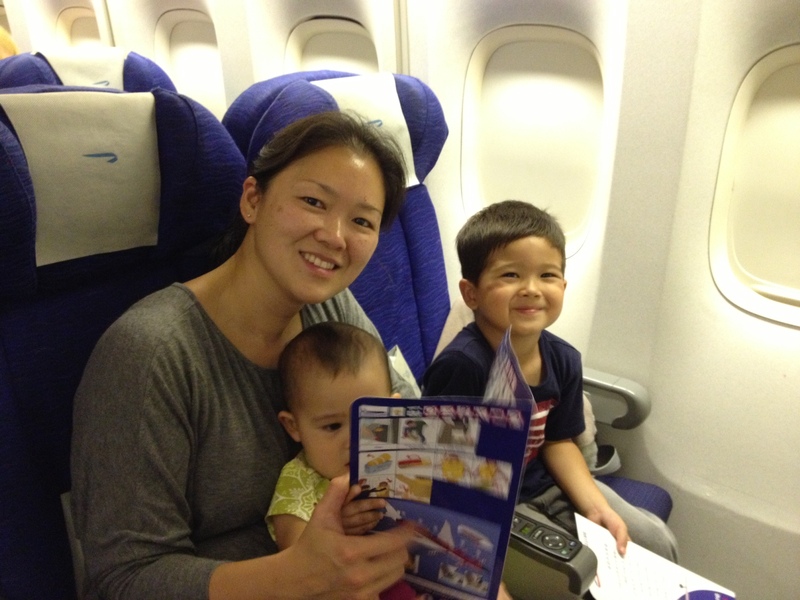 After we said our goodbyes, we boarded the plane and settled into our seats. We were on a British Airways 747 plane. 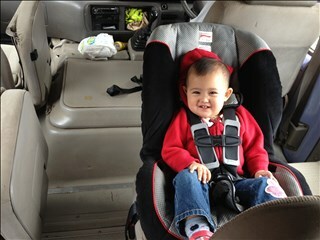 We chose bulkhead seats thinking Kate might sleep for most of the flight on the baby seat. She did sleep on the seat for an hour, but refused to be put back. The 9 hour flight went well. Luke kept himself busy with the movies, just like his dad. 🙂 We landed at London Heathrow the next morning and looked for our gate connection on the monitors. When we couldn’t find our flight, we asked and found out that it has been canceled due to a fire at the airport. At this point, we were in shock, tired and sleepy, waiting in line to speak to an agent to hear our options. We were in line with two other believers and started a conversation. They were coming to speak at conferences in Kenya. We were told that we had no options of flying into Kenya since the airport is totally shutdown due to the fire. We later found out that the fire had started 2-3 hours into our flight. British Airways did put us in a hotel and pay for our meals for a day but we had to go back each day to check for a flight and request a voucher for the room and meals. 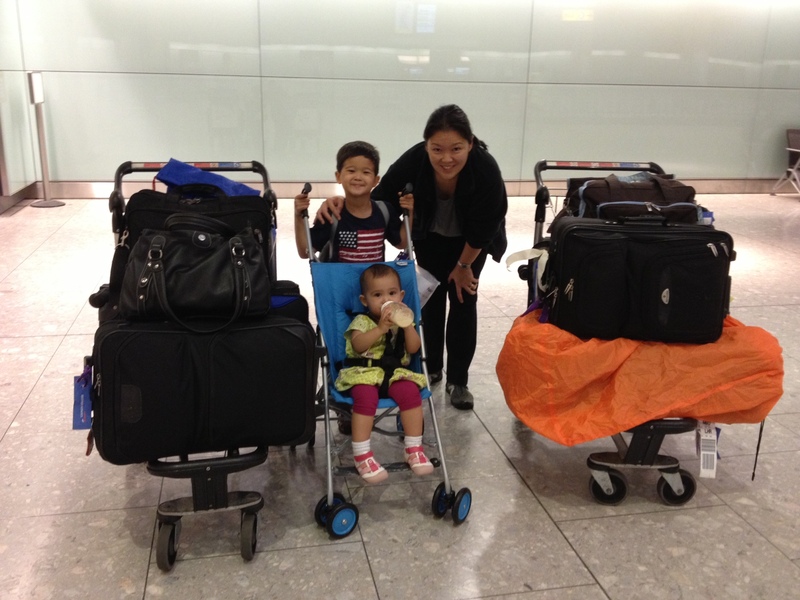 Because we were forced to stay in London, we then had to go to through customs and immigration and get our bags, etc. Thankfully, British Airways stored our luggage for us during the entire time in London – we did pull out a few bag that we packed for the week of orientation in Nairobi, though. We finally checked into our hotel which was a three minute walk connected to the airport. 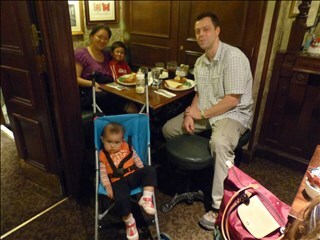 We then grabbed some lunch and all took a long nap until dinner time – jet lag had caught up with us. 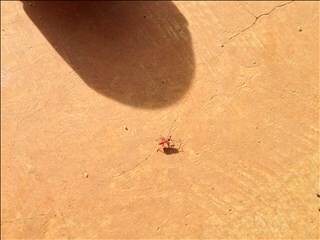 The next morning Tim walked over to the airport to check the status – the Nairobi airport was still closed. They gave us another voucher for the hotel and meals, praise the Lord. We decided to make the most of our time in London, so we took the Underground to London to see some sights later that day. We did this for the next three days we were there and in retrospect are thankful for this “forced vacation.” We did have a little trouble with jet lag – especially the kids. The first day we left for London at 5pm, the next day 3pm, and the next 1pm. Even now, we are slowly adjusting our time clock. 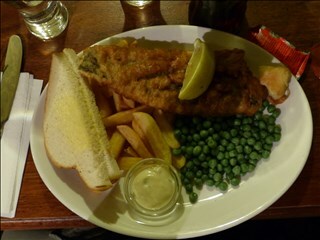 In the end, British Airways paid for our hotel and meals except for the last night. We could have taken a different airline a day earlier, but with our number of bags and kids, we decided to stick with a BA direct flight to Nairobi (8 hours). Our flight was an extra flight to relieve the stranded passengers on both sides. We are so thankful that we were not near the airport when the fire occurred and from what we’ve heard, there were no injuries. 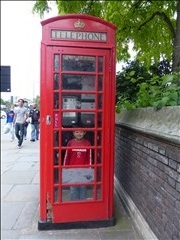 Phone booth – what’s that? Last meal . 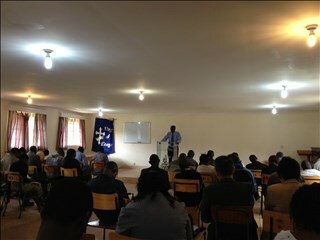 . .
We’ve now spent a week in Nairobi and have begun the process of orientation. We’ve had the meetings, been told what we need to know, but will really be orienting ourselves to life in Kenya over the coming weeks and months. In one sense, we’ve gotten used to living here in Nairobi but will be making another transition as we move to Kijabe on the 21st. God has been good to us. The last few months have not been easy for our family and even the journey here to Kenya was not what we expected. As I look back over the past two weeks, I can see how God has guided and protected my family and know that He is with us now. We will send out additional blogs to share more about our journey. Thank you very much for reading! We’d love to hear from you and feel free to ask any questions as well. 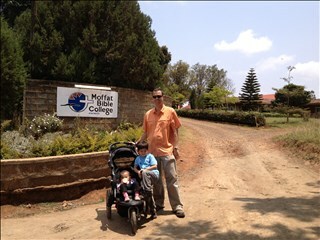 We arrived safely in Kenya this past Monday morning. Sorry for not posting an entry sooner . . . we’ve not had easily accessible internet access until today. The night flight went well but none of us really got enough sleep. We were dragging by late afternoon. Tents had been set up at the airport to replace the burned building and the entry process into Kenya went smoothly. We did have a little trouble managing our bags through the improvised customs scanning area (a mobile scanner in the back of a van) but managed with a little help. A nice customer service rep named Celestine helped us through customs and even called the person who was there to pick us up. With the improvised entry process and location the pickup point was not that clear. With all of our bags (minus one which is still lost) piled in and on top of a land cruiser we were on our way. We’ll write a bit more later as we work through orientation and find out more about our transition to Kijabe – which should take place next week. For now, thanks for your prayers and support. We are safe . . . but in London. Check-in at DFW went smoothly. 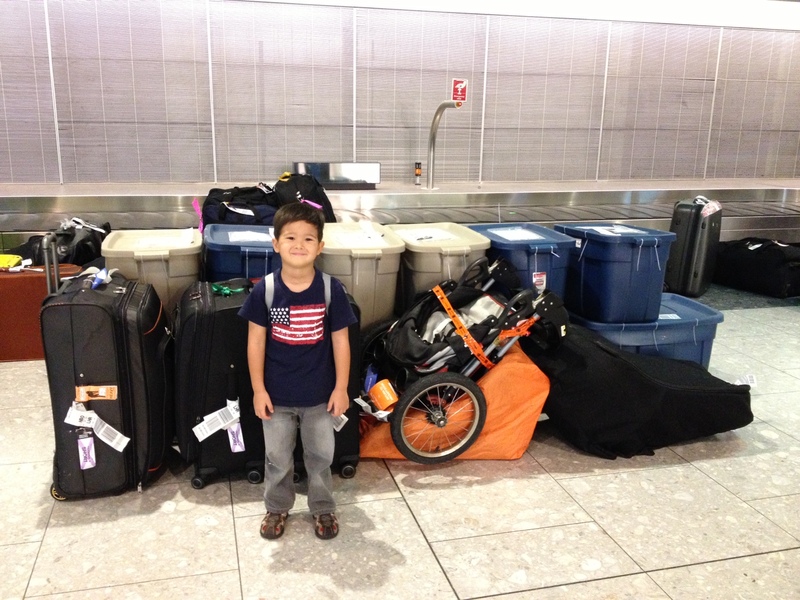 We were able to make it with our 17 checked bags in one trip thanks to Arlin. After our final good-byes, we worked our way through security and to our gate. The initial flight went well – Luke and Kate did great! We arrived in London a bit tired but ready for our quick one hour layover. Our layover looks like it might turn into a short “holiday” in London. Evidently, a few hours into our flight from DFW to London Heathrow a fire started at the airport in Nairobi. We were informed shortly after our arrival in London and have since learned that the arrivals and immigration areas of the Nairobi airport were the most impacted. British Airways is not sure what will happen in the next few days but has provided hotel accommodations and meals for us for tonight. After a short rest and a meal we checked back with the airline and have been booked on a flight next Wednesday. We’ve been told that the only international carrier being allowed into Nairobi is Kenya Airways and there are no flights available with this airline. Things could easily change in the coming days and we might be able to make our way to Nairobi sooner. Your prayers are appreciated as we wait for things to develop. Please know that we are doing well and trusting God to work out all the details. Thanks to all of you who have already reached out to us by email, phone, and Facebook. Our magicJack line works great here when we have wifi – if you need or want to call please feel free – 817-264-3852. If we miss your call, please leave a message and we’ll call you back. 13 Bags and Counting . 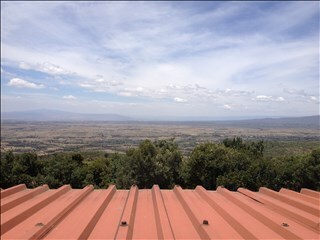 . .
It’s hard to believe we leave for Kenya in less than three days! 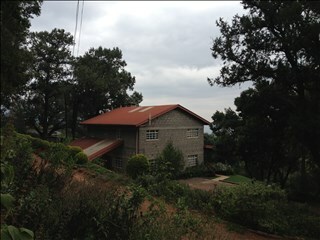 We’re excited, nervous, a bit tired from packing but are looking forward to what God has in store for us in Kijabe. The last week has been busy but good. We’ve had time to hang out with friends and family and spend some downtime relaxing. Our home church, MacArthur Blvd Baptist Church, allowed us some time this past Wednesday evening to share and spent time praying for us. We are blessed to be a part of this body of Christ. As we sit here trying to decide what to write, the reality of how much we will miss family and friends is becoming almost tangible. There will no doubt be many tears shed this coming Tuesday but we leave knowing that God has taken us to this point. We trust fully in His care and His guidance. We will be discontinuing cell phone service after Sunday. Please give us a call on our magicJack line (817-264-3852) or drop us an email. Once we arrive in Kenya, we will forward additional contact information.